Last month I gave you six rules to consider before starting any kind of business or self-employment. This month I shall highlight the different methods of going solo. First consider whether this will be a full time or a part time venture. If you already have a job, I recommend you look for part time business opportunities initially. This will significantly lessen the risk and give you valuable experience to build on for the future. Once you are sure you have chosen the right business and that you can run it successfully, then you can consider giving up your existing job. 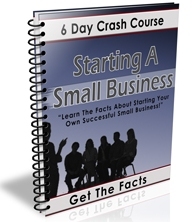 Too many people make the jump into an unproven business and blow their savings or get into debt when it fails. If you don’t have a job at present then it may be possible to set up in full time self employment. So what’s the difference from being self employed and starting a business. Most people think it means the same thing, however, going self employed means exactly what it says – you employ yourself! In other words you create a job for yourself. Running a business means developing something which can stand alone, maybe even employing other people. Being self employed can often bring more freedom than building a business as you only have to worry about generating a decent income for you, not taking resonsibility for a whole bunch of staff. On the other hand, self employment is just you and your skills so it will never have any intrinsic value in itself. Whereas building a business means you may have something of value to sell when you want to retire. The choice can be the difference between freedom now and more freedom later! For the rest of this article I shall concentrate on self employment. This is the simplest way to start if you have a valuable skill to sell and also needs less investment. You can operate from home so need no business premises or other overheads (business costs). a. Decide what skill or service you are going to sell and to whom then offer your services to the people or companies you have identified as possible customers. I shall talk about how to do this later. b. Find an agency specialising in selling your skills and apply to go on their books – they will find the work and pass it out to the appropriate people on their list. All you have to worry about is satisfying their customers so you get more work from them. c. Locate companies who provide services that need your skills and offer to do work for them on a freelance or contract basis. Often companies have more work than they have staff to carry out, or they have seasonal ups and downs in demand and use freelance staff to fill the gaps. d. If you have good sales skills, then you may be able to sell goods and services for other people on an agency basis. This can be very lucrative as good sales skills are in great demand. e. If you have good craft or engineering skills or similar, you may be able to gain work producing products for other businesses to sell. Or if you are creative and can produce good written work, design work, software etc. you may be able to do this for other businesses that lack such skills. f. Similarly, you may be able to make crafts/gifts or produce paintings or other art objects to sell at craft fairs, markets etc. g. If you can spot a good bargain and can negotiate and buy well perhaps you could buy and sell used items at markets, car boot sales, table top sales, town/village fairs etc. There are probably as many ways to achieve self employment as there are people wanting to be self employed. Prior to the industrial revolution, a large proportion of the population was effectively self employed! I hope this has given you a few ideas to think about. Next time I shall look at the other side of the coin, namely how to start a business that you can build for the future.